Enjoy the music stored on your Smartphone or iPod while you're on the move with the TeckNet F27 FM Universal Transmitter. 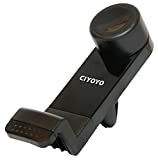 Great value, easy-to-use and featuring an extra USB port, this handy bit of kit will also charge your device while you drive. Gone are the days when our glove compartments were bursting with of piles of CDs. Most of us now have a more convenient way of storing our tunes, but it's still nice to hear them through our car's stereo system. This compact transmitter allows you to do just that by using FM radio waves to send your favorite music from your mobile device to a nearby FM radio. Simply plug into the earphone socket then tune your FM radio to a clear frequency and enjoy your digital music collection wirelessly in rich, high quality sound.